AT&T had an incredibly successful 2016, posting profits of $13.3 billion, according to the company's latest financial report released yesterday. Revenue is up 11.6 percent over 2015. There was a lot of good news, and CWA members, whether we're working at wireline, Mobility, DIRECTV or Internet Services, know that it's our hard work that makes these profits possible. AT&T Mobility posted record profits, DIRECTV Now saw 200,000 signups in its first month, and 11 million new smartphone subscribers signed up in the fourth quarter. Across the country, CWA members are standing together and putting AT&T on notice: "We service the customers. We sell the plans. We maintain the network. We deserve our fair share." The CWA bargaining team opened contract negotiations with AT&T Mobility yesterday. The "orange" agreement covers about 21,000 workers in Districts 1, 2-13, 4, 7, and 9. 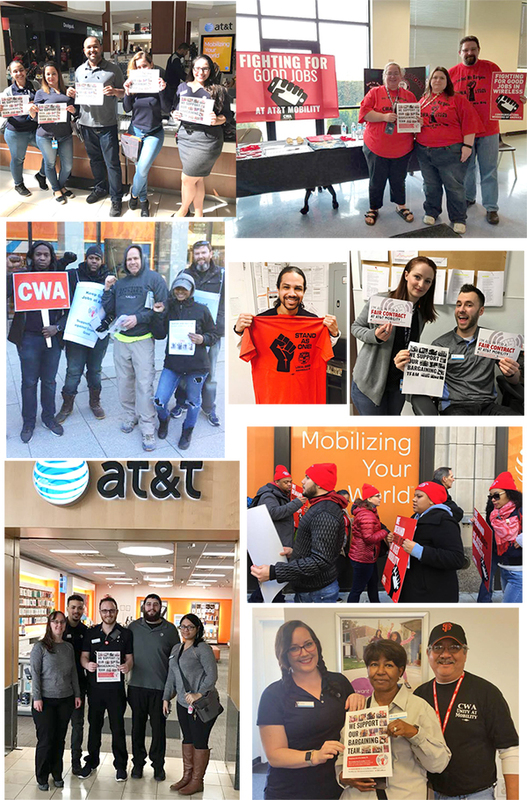 Across the country, AT&T workers held informational pickets outside Mobility stores and showed their solidarity with inside actions at call centers and retail stores. CWAers are united, ready to do whatever it takes to win a fair contract. The current contract expires Feb. 11. CWA's Mobility bargaining team is: Mike Baxter, Local 1101; Frank Oliva, 1298; Deb Casey, 2204; Jeff Reamer, 13000; Julie Daloisio, 13500; Holly Sorey, 4202; Glen Skeen, 4320; Debbie Goulet, 7803; Hector Capote, 7250; Brandon Beck, 9511; Joe Sison, 9412; and Pat Telesco, District 1, Chair. CWAers rally on the first day of Mobility "orange" bargaining. Clockwise from top left: Hialeah, Fla., Local 3121; Seattle, Wash., Local 7803; Evansville, Ind., Local 4900. Center photo: Annandale, Va., Local 2222; New York City, Local 1101; Fresno, Calif., Local 9408; Philadelphia, Pa., Local 13000; and Boston, Mass., Local 1298. CWAers in District 9 used AT&T's very positive fourth quarter earnings report to remind the public and the company that the technicians, call center representatives, and other workers play a big part in the company's success. But AT&T's greed is hurting customers and workers. Orange Richardson, a technician in San Francisco, told the media, "Across California and Nevada, AT&T is eliminating good, middle-class jobs in our communities and is undercutting technicians whose customers depend on for quality service. AT&T has cut 7,000 call center jobs, closing some centers altogether, in California and across the country. More jobs have been shipped to Mexico, the Philippines, India, and other countries. More jobs have been shipped overseas. What kind of future will our kids have if a company that makes a billion dollars a month eliminates good jobs in California?" Local elected officials are signing on to a letter supporting CWA workers, and CWAers are standing with Mobility workers who just began negotiations for a new "orange" contract. CWA Telecommunications and Technologies Vice President Lisa Bolton said CWA is actively working to safeguard the workers and retirees of Avaya as the company moves through the bankruptcy process. Avaya announced on Jan. 19 that it was filing for bankruptcy protections. CWA has retained bankruptcy counsel and is diligently representing our members' interests as this process goes forward. CWA represents about 550 active workers and thousands of retirees at Avaya.